Extramedullary plasmacytoma represents 3%–5% of all plasma cell neoplasms. Plasmacytomas of the mesentery are extremely rare. We report the case of a 56-year-old man who presented with an abdominal mass and was diagnosed to have plasmacytoma of the mesentery. A literature review was also conducted on publications pertaining to solitary mesenteric plasmacytomas. These patients present late by which time the abdominal mass has reached a significant size. Radiation as a modality for local control has a limited role in treating mesenteric plasmacytomas. Surgery is the preferred modality for local control. Patients must be kept on a regular follow-up as there is a risk of transformation to multiple myeloma. Extramedullary plasmacytoma represents less than 5% of all plasma cell neoplasms. Extramedullary plasmacytomas commonly arise in the head and neck region. The mesentery is a very rare site of solitary plasmacytoma with only about 10 cases reported in literature,,,,,, Here we report a case of mesenteric plasmacytoma with two separate lesions in jejunal mesentery. We also present a literature review of the published cases of mesenteric plasmacytoma. A 56-year-old male was evaluated with low backache and lower abdominal mass. On examination, the patient had a 6 × 6 cm mobile mass in the infraumbilical area. The patient did not have any hepatosplenomegaly or any enlarged lymph nodes. A contrast-enhanced computed tomography was done for workup which showed a soft tissue mass of 7.2 × 8.4 cm with necrotic areas abutting small bowel loops [Figure 1]. A separate lesion of 2.9 × 3.2 cm was also found adjacent to this mass. Radiological diagnosis was gastrointestinal stromal tumor (GIST) in view of necrosis within the mass. The lesions were operable radiologically and were planned for exploratory laparotomy. The patient underwent exploratory laparotomy, and intraoperative findings revealed two lesions arising from the mesentery of the jejunum (8 × 6 cm and 2 × 3 cm). The lesion was not adherent to the surrounding structures and the patient underwent excision of the tumor along with jejunum in January 2016. Histopathological examination revealed two lesions of 11 × 8 × 9 cm and 3.5 × 3 × 2.5 cm situated 1 cm apart which were well-encapsulated. Microscopic examination revealed plasma cell infiltrate admixed with small lymphoid cells. The plasmacytoid cells were CD38+, CD138+, CD20−, and EMA−. Plasma cells also showed kappa light chain restriction [Figure 2]. The findings were suggestive of plasmacytoma of the mesentery. He was further worked up for multiple myeloma. His hemoglobin was 13.9 g/dL and renal functions were normal. Serum calcium was 9.2 mg/dL. His immunoglobulin assay showed an IgA fraction of 130 mg/dL, IgG 2103 mg/dL, IgM 110 mg/dL, free kappa 27.6 mg/dL, and free lambda 19.6 mg/dL. Serum protein electrophoresis and immunofixation electrophoresis showed a band in IgG kappa area. His bone marrow study was normal. Urine Bence Jones protein was negative and 24-h urine protein was within normal limits. There were few small lytic lesions in calvarium, though not convincing enough lesions elsewhere. The patient was staged as multiple myeloma ISS stage 1 (two plasmacytomas histologically proven with lytic lesions in skull). The patient was planned for chemotherapy with bortezomib, lenalidomide, and dexamethasone. After six cycles of chemotherapy, the patient was re-evaluated and was found to be in complete response and planned for autologous stem-cell transplant. A computed tomography of the abdomen and pelvis did not show any evidence of disease. The patient was started on lenalidomide maintenance while waiting for stem-cell transplantation and he completed stem-cell transplantation and is currently on follow-up. Mel200 protocol was used for autologous stem-cell transplantation. Six months of follow-up after stem-cell transplantation shows that the patient continues to be in complete response. Extramedullary plasmacytoma commonly arises in the head and neck region. We did a literature search and found seven cases of solitary plasmacytoma of the mesentery,,,,,, [Table 1]. A descriptive analysis including the present case was conducted. Mesenteric location of the plasmacytoma has certain peculiar features. The median age at diagnosis was 58 years (range 46–69 years) and all except one patient was male. The age distribution is similar to other plasma cell disorders. The patient usually has no specific symptoms and the tumor usually reaches a significant size before becoming symptomatic. The mesentery being a mobile structure in the abdomen usually causes pain or obstructive symptoms very late. These tumors also reach a significant size before being diagnosed; the median tumor size in literature review was 11.9 cm with size more than 15 cm reported in two case reports. The radiological diagnosis in all the patients was GIST or a lymphoma of the mesentery, and almost all cases are diagnosed on histopathological examination. Solitary plasmacytomas usually require only local treatment and follow-up although there is a significant risk of transformation to multiple myeloma. Radiation has been commonly used as a modality for local control in patients with plasmacytoma with almost equal results to that of surgical resection. But mesenteric plasmacytomas pose a rare challenge to the radiation oncologist in that these tumors despite acquiring huge size are mobile within the abdomen. This is clearly reflected in our literature review with only one patient receiving radical radiation. All patients underwent surgery as a part of local treatment, and a wide local excision with adequate margins seems adequate for local control in these patients. Chemotherapy is not usually needed in patients with isolated mesenteric plasmacytoma without evidence of myeloma. In there were two separate lesions in jejunal mesentery along with small lytic lesions in the skull. Therefore, the patient underwent chemotherapy with six cycles of chemotherapy with bortezomib, lenalidomide, and dexamethasone followed by autologous stem-cell transplant. None of the other patients in the literature review received chemotherapy though one patient was planned but did not receive it as the patient was lost to follow-up. The role of chemotherapy in patients with solitary plasmacytoma needs to be further studied although many clinicians use this approach to reduce the risk of transformation to multiple myeloma. There are also reports that show good response to chemotherapy for extramedullary plasmacytomas. Survival outcome in patients with mesenteric plasmacytoma was encouraging in the literature review with none of the eight patients showing any signs of progression. But analyzing outcome form case reports is usually difficult due to the inherent bias associated. But these patients may transform to multiple myeloma, so must be kept on regular follow-up. Four to six monthly follow-up with immunoglobulin assay and electrophoresis may be a reasonable approach in such patients. Weber DM. Solitary bone and extramedullary plasmacytoma. Hematology Am Soc Hematol Educ Program 2005;1:373-6. 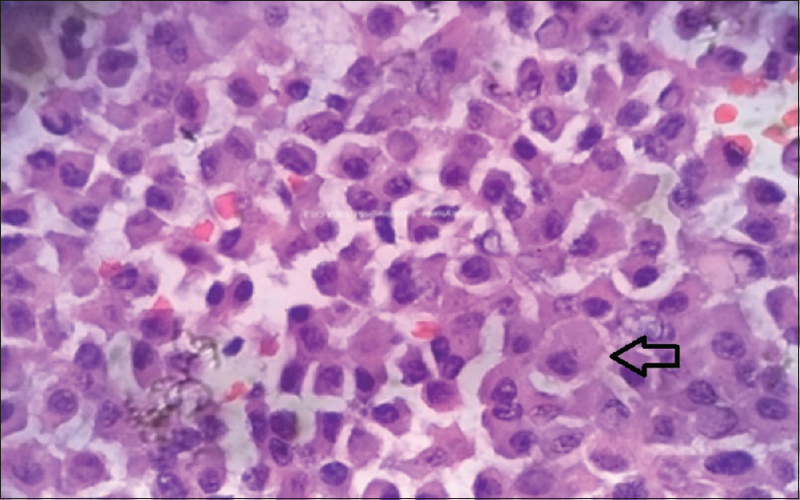 Galhotra R, Saggar K, Gupta K, Singh P. Primary isolated extramedullary plasmacytoma of mesentry: A rare case report. Gulf J Oncolog 2012;12:81-4. Mitropoulou G, Zizi-Sermpetzoglou A, Moschouris H, Kountourogiannis A, Myoteri D, Dellaportas D, et al. Solitary plasmacytoma of the mesentery: A systematic clinician's diagnosis. Case Rep Oncol Med 2017;2017:5901503. Jarry J. Solitary mesenteric plasmacytoma revealed by an acute intestinal obstruction. Gastroenterol Clin Biol 2009;33:432-4. Ikeda A, Takiguchi N, Nabeya Y, Soda H, Tonooka T, Kainuma O, et al. Extramedullary plasmacytoma in the mesentery. Jpn J Gastroenterol Surg 2016;49:746-53. Kulkarni SH, Agashe SR, Mane VP, Ingty M. Solitary extramedullary plasmacytoma of mesentery: A rare presentation. Med J Dr Patil Univ 2014;7:798-801. Rosic T, Ross D, Nethathe GD. 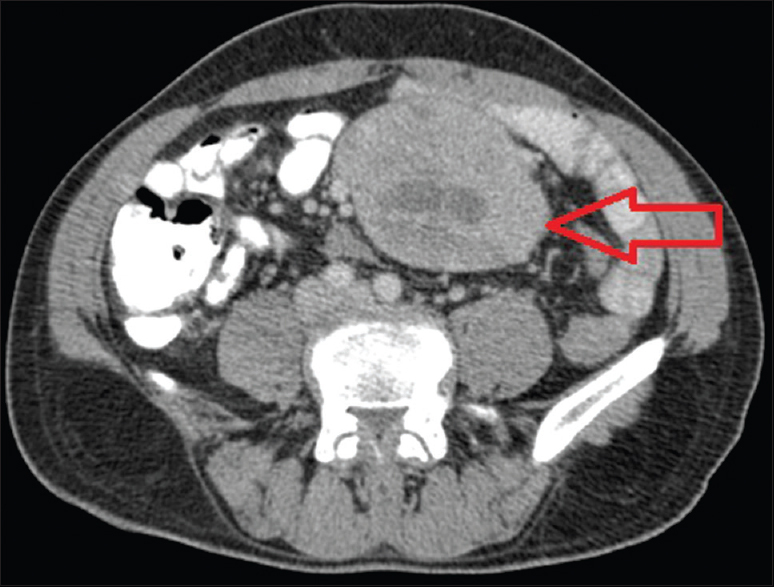 Mesenteric plasmacytoma: An unusual cause of an abdominal mass. S Afr J Surg 2014;52:61-2. Sugeeth MT, Vishnu H, Nandini Devi R, Geetha N. Plasmacytoma of the mesentry – A case report. Sch J Med Case Rep 2016;4:312-4. Rajkumar SV, Kumar S. Multiple myeloma: Diagnosis and treatment. Mayo Clin Proc 2016;91:101-19. Wiltshaw E. Chemotherapy in the management of extramedullary plasmacytoma. Cancer Chemother Pharmacol 1978;1:167-75.